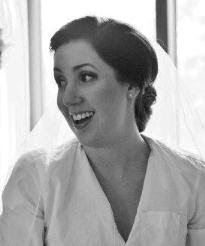 If you've been reading for awhile, you've perhaps noticed the conspicuous absence of baked goods and desserts on this blog. I'm totally going against the better part of the blogsphere here, but I don't have much of a sweet tooth. I love just a bit of dark chocolate after dinner or if I'm feeling really nuts, some chocolate and berries. The entire cake pop phenomenon is lost on me. When celebrating my dear cousin's birthday this weekend, I knew it would be customary to bring a dessert. It was also 100+ degrees, so I needed something that didn't require an oven and would incorporate her beloved strawberries. Decided to kick it old-school with an icebox cake. No, there is no jello or packaged whipped cream. This is legit. Perhaps we should call it "midcentury" instead of old school. In case you need more convincing to keep reading...it has Nutella. The key is to start with high quality ingredients. I love these butter cookies from Trader Joe's, but graham crackers would work too. Mascarpone cheese will add needed richness; taking you away from "fluff" territory. Don't worry....you'll never see this part. Just break up your cookies enough to cover. There's no need for packaged whipped cream now that there is electricity. 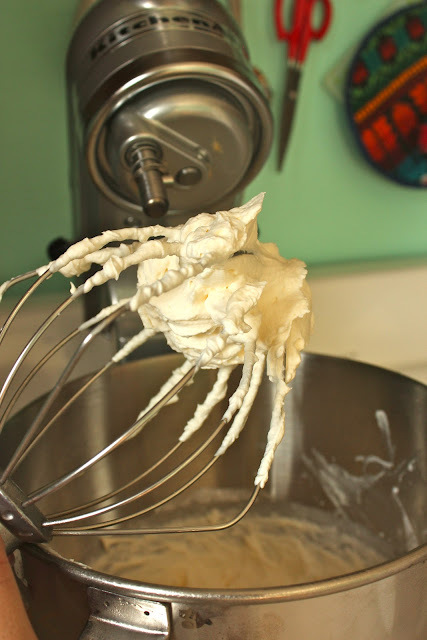 You'll be amazing how quickly you can make fresh whipped cream in a stand mixer or with a hand mixer. 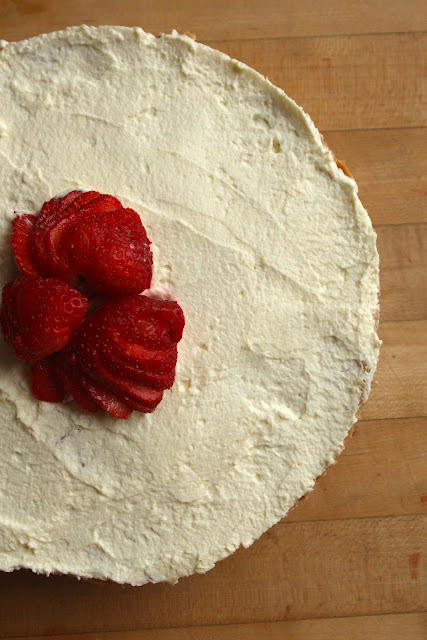 Since this is a layered cake, you'll need very stiff peaks for your whipped cream. This is tough cream, yo. You wouldn't want to meet this stuff in a dark alley at night. Just sayin'. You'll do the whipped creams in two batches. One plain and another with Nutella. This will make for a beautiful, layered presentation. Once the creams are prepared, you'll slowly start layering. Cookie. Cream. Strawberry. Cookie. Other Cream. Strawberry. Finish with the plain whipped cream and smooth out the top. Cover and refrigerate overnight (or at least 8 hours). This will give time for the cookies and cream to marinate and come together texturally. The cream has a magic way of making a crunchy cookie soft and cake-y. When you're ready to serve, run a knife around the edge and release the springform pan. See how the layers have come together? Smooth the edges and garnish with strawberries. It's a nice preview to what you'll find inside. Start by combining ingredients for the plain whipped cream -- half quantities of cream, mascarpone, sugar and vanilla. Whisk together in a cold bowl until stiff peaks form. Clear from bowl and reserve in refrigerator. Next, combine ingredients for Nutella cream -- half quantities of cream, mascarpone, sugar and vanilla and full quantity of Nutella. Whisk together in a cold bowl until stiff peaks form. In a 10-inch springform pan, begin with layer of cookies, then add Nutella cream and sliced strawberries. Continue layering in that order, alternating plain and Nutella whipped creams. Finish top by smoothing plain whipped cream. Cover and refrigerate cake overnight. Garnish with strawberries and serve cold. Ricotta would probably be just fine, I'd just be careful that the texture was firm enough (maybe go with a thicker cookie). Cream cheese would also be a good substitute. That looks so amazing! 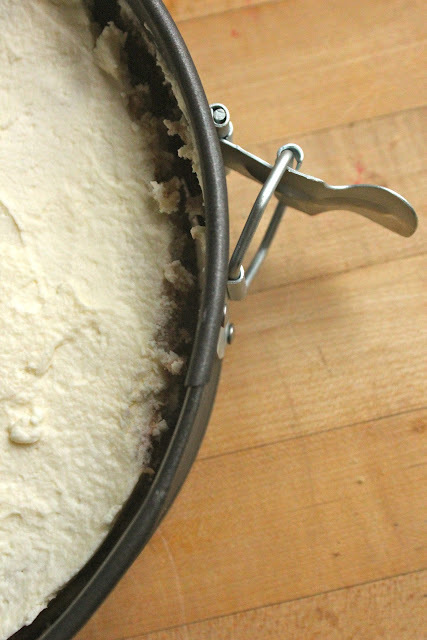 I've always wanted try a classic ice box cake, but all that heavy cream scares me. I have to remember it's really not any worse than buttercream frosting! Anyway, I might have to try this.